Since 1902, Southern Teachers has helped schools hire great science teachers. Today, however, in a time of rapid digital and pedagogical change, the challenge for schools to craft productive and meaningful classroom experiences for their students is greater than ever. The private and independent schools with which Southern Teachers works seek bright candidates who are eager to accept the challenge offered on this bold new pedagogical frontier. As a result, while successful progress through a teacher certification program can be highly desirable, these schools are eager to hire teachers who have strong content knowledge in science, enthusiasm for leading extracurricular programs, ability to manage and motivate students, as well as a desire to incorporate technology into their teaching methods. Simply put, a degree in education is not necessarily required. Great independent schools will hire smart chemistry majors (and minors!) who have not been through a certification program. Moreover, the teaching environment in these independent schools can be exceptional: small class sizes, students intent on preparing for college, and a focus on learning chemistry—not on test taking. Southern Teachers works with hundreds of schools that list thousands of jobs each year, including hundreds for science teachers. School administrators trust Southern Teachers to know our candidates because we interview every candidate and check references, too. That is to say, for over a century, we’ve provided superior service to young graduates who are seeking jobs. And it’s a free service for candidates. Schools pay for our services—because they want the best teachers possible. Cincinnati District has Job Vacancy Announcements open for CSO (Consumer Safety Officer = Investigator) positions in Brunswick, Columbus, Toledo, Cincinnati and Louisville. These positions are for scientists of various types. CSOs are on the front line protecting the American consumers by performing on-site inspections of manufacturing processes & technology, gathering evidence in outbreak investigations, enforcing regulations and responding to emergencies involving FDA regulated products. Further information can be found in the specific job announcements on USAJOBS.gov. A Recent Graduate is: An applicant within 2 years of receiving his/her college degree or certificate. Veterans, precluded from applying due to military service, must be appointed within 6 years of receiving their degree or certificate. The CSO position has an educational requirement of 30 semester hours of science. The promotion potential of position is the GS-12. Additional information is contained in each of the two job announcements. Please note that this job announcement is only open for 7 days! I’m more than happy to help anyone with any questions. If you’re interested in taking part in a free trial of an app that provides access to all the Chemistry Primers or Biomedical Science Series, please join the waitlist here: http://bibliotech.education/?trial=courseadmin4. You will have free access for 4 weeks. The app is built for your laptop and tablet and includes a search engine which searches across the entire catalogue and extracts definitions, diagrams and examples for you. Manage direct sales efforts of Chromaflo Technologies’ Paint & Coatings business in assigned territory. Increase sales and share through existing accounts, development of new accounts and support to external sales representatives (Distributor/Agent) in assigned territory. Responsibilities include direct management of existing and new customer relationships and increasing Paint & Coatings product sales in the assigned territory through market development and conversion of primary sales targets including the proliferation of existing product lines and new product line introductions. Maintain close contact with customers and develop strong relationships with key decision-makers, including technical personnel, purchasing and marketing departments. Know customer requirements, processes, direction, potential, structure, and market share. Communicate internally for maximum support and customer satisfaction. Know and understand what Chromaflo Technologies has to offer and effectively communicate to customers. Capitalize on opportunities to grow the territory through the introduction of products, services and other capabilities. Cultivate internal relationships to assure customers are supported internally to assure high level of customer satisfaction. Effectively communicate, internally, customer strategies and requirements. Manage relationships with external sales representatives (Distributor/Agent) through joint customer development, account conversions, and customer relationship support. Support and achieve the Sales Plan through the retention of key accounts and development of target accounts. Increase sales in the territory for maximum profitability. Communicate all important business, market, competitive, and customer issues on a timely basis to management and those others involved. Report project status, business activity, and market intelligence to the Business Director Coatings – Americas on a monthly basis. Summarize activities on a routine basis as required and provide quarterly reviews to plan. Submit reports, including customer call reports, on a timely basis. Comply with safety rules and regulations. Report injury/illness and/or environmental incidents. • Prevention of personal injury/illness. We are pleased to announce the launch of OneStart 2016, the world’s largest life sciences and healthcare accelerator program. Offering young entrepreneurs the chance to win $150k, free lab space and on-going advice from our extensive mentor network drawn from McKinsey and Co., Johnson and Johnson, GlaxoSmithKline, AstraZeneca, SR One, Takeda Ventures, and more. Many of our graduates have been successful in securing follow-on investment, our alumni raising over $30 million combined! Anyone under 36 years old interested in healthcare entrepreneurship. We welcome applicants from all disciplines and ideas at all stages of development – from a simple idea to a startup with ample data. Moreover we encourage applicants to recruit other scientists, engineers, business students, lawyers, and anyone else with talent and motivation to join your team. Have a fantastic idea but no co-founders; why not assemble your team through our co-founder hub, connecting innovators across the globe. Again, there is no cost to apply. Applications are reviewed in Dec 2015 and 35 semi-finalist teams are selected to attend a two-day Biotech Bootcamp based in San Francisco on 19th and 20th Feb 2016. Consisting of workshops and networking opportunities with our mentors and partners. Each team also receives 1-on-1 mentorship from our industry experts over 7 weeks. The program ends with the Finals Gala, at which 10 exceptional finalist teams compete for the grand prize. Throughout October launches are being held across the world. You’ll be directly interacting with experts across healthcare and life sciences drawn from pharma, biotech, venture capital, management consulting and more. If you have any further questions feel free to get in touch via jess@oxbridgebiotech.com or reach us through our dedicated discussion forum. What are you waiting for? Visit onestart.co today. Applications are open NOW. We can’t wait to hear about your ideas. Description:The Department of Chemistry and Biochemistry in the College of Arts and Sciences at The Ohio State University seeks to fill a tenure-track faculty position at the assistant professor level in one of these two areas: Inorganic Materials synthesis OR Materials Characterization to begin Autumn Semester 2016. This position is partially funded by Ohio State’s Discovery Themes Initiative, a significant faculty hiring investment in key thematic areas in which the university can build on its culture of academic collaboration to make a global impact. Qualifications: A Ph.D. in inorganic, analytical or related fields are required. Candidates with research interests in the synthesis of materials based on organometallic, bioinorganic and main group chemistry are encouraged to apply. In the area of Analytical Characterization, candidates with research interests in the development and application of state-of-the-art characterization techniques that can advance Ohio State’s commitment in materials/measurement science are encouraged to apply. Demonstrated excellence in innovative research and a strong commitment to teaching are essential. Priority will be given to those candidates whose research interests complement those of existing faculty. Appointment is contingent on the university’s verification of credentials and other information required by law and/or university policies, including but not limited to a criminal background check. Please apply online through Academic Jobs Online at: https://academicjobsonline.org/ajo/jobs/6321. Complete applications will include the curriculum vitae including publication list, a summary of past research accomplishments, a statement of teaching and research interests, and three letters of recommendation. Applications will be accepted until the position is filled, but application review begins October 15, 2015. For further information, contact: Materials/Characterization Faculty Search Committee, c/o Susan Krumm, skrumm@chemistry.ohio-state.edu. 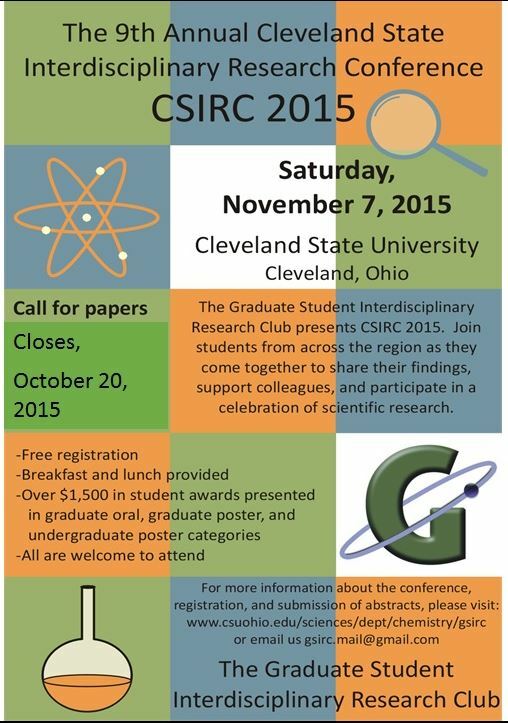 The Graduate Student Interdisciplinary Research Club (GSIRC) is calling for abstracts for the Cleveland State Interdisciplinary Research Conference (CSIRC). Both oral and poster presentations are invited. Though our affiliation is to science disciplines, we encourage researchers from all avenues of research to make a submission. Graduate and undergraduate research are separately assessed and recognized with monetary awards. Abstracts should be electronically submitted as Microsoft Word file attachment gsirc.mail@gmail.com adhering to the following format. Authors: List names [first name, middle initial (if applicable), last name] and highest degrees. Affiliation should be included as a superscript number defined later. Presenting author should be in bold lettering, underlined. Identifying the affiliation: Department and/or institution / company; new line below authors, define superscript numbers associated with the respective author name. If there are two or more authors from same entity, use same superscript number. Abstract body: Single spaced; do not indent. Maximum of 400 words, excluding title and authors. Text only no figures or tables. Paragraph spacing: We recommend appropriate single line space between paragraphs, for best appearance when directly converted to pdf format. All text in black and white; no colored fonts. Faculty, employees and/or students who wish to attend the conference can RSVP to the above email. We encourage students from a given institution to RSVP as a group.